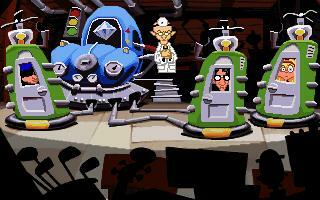 Day of the Tentacle is the sequel to Maniac Mansion, but although based on the same basic premise, is a completely different game. 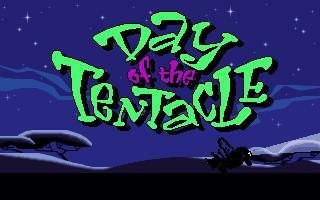 With artists that were seemingly taken directly from Warner Bros' classic Road Runner, combined with the talent of the likes of Ron Gilbert, Day of the Tentacle is more than just a game: it is a surreal adventure with a long and complex story. 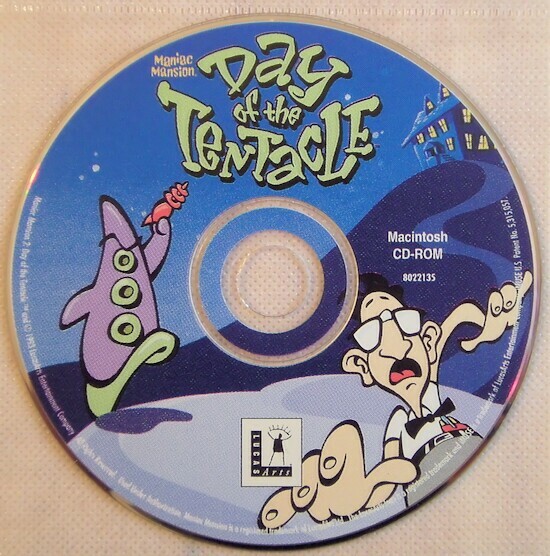 Purple Tentacle, one of crazy Dr. Fred's creations, drinks contaminated water from Dr. Fred's Sludge-o-matic, mutates into an insane genius and grows arms, and now he's plotting to take over the world. In an effort to stop him, Dr. Fred sends the three friends, Bernard, Hoggie and Lavern back in time to stop the sludge from spilling into the river. Naturally, the cheap doctor uses a fake diamond in his time machine, which promptly blows up and sends Hoggie 200 years into the past and Lavern 200 years into the future.